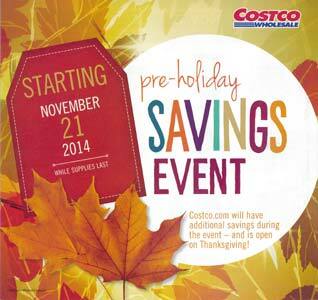 The first Costco Black Friday 2014 ad is now posted. There are 87 deals in total in the Pre-Holiday coupon book. Clicking the link above will allow you to view the PDF, download it, or print it out if you’d like. The first four pages run from November 21st through December 1st, which encompasses Black Friday weekend. The next four pages run from November 21st through November 26th, ending a day before the Thanksgiving holiday. The last three pages are online only offers valid from November 21st through November 27th, which includes Thanksgiving day in case you want to do some online shopping that day. The Costco stores will not be open on Thanksgiving day (bucking a controversial trend). There is also another Costco Black Friday 2014 ad scan you can see on my site which runs from November 28th through the 30th. All of these items are Instant Savings and will not require a clipped coupon in order to take advantage of them. The prices in this coupon book are reflective of the Bay Area Costco region and may not reflect final price at your Costco location. It’s an exciting time of year to be a Costco member as there are plenty of deals to be had. Also take a peak at the November Coupon Book, which is also running right now. The most talked about items in this coupon book are the Samsung TVs. Specifically the 65″ and 75″ TVs. Read more for a list of products with prices.